On Wednesday, April 11, Jennifer Smyser gave a lecture on the state of the on-going international and domestic efforts at guaranteeing worldwide nuclear security. As a Program Officer in Policy and Outreach at The Stanley Foundation, Ms. Smyser is a member of Fissle Materials Working Group (a nongovernmental coalition of over 40 experts representing many of the top nonproliferation and nuclear security organizations). The entirety of global nuclear security depends on accounting for, stockpiling, and securing of nuclear materials, especially Highly Enriched Uranium (HEU) and separated plutonium. Thirty countries depend on nuclear power as a source of electricity (which utilizes Low Enriched Uranium). Of these countries, only the United States, Russia, the United Kingdom, France, China, India, Pakistan, and North Korea have successfully detonated nuclear weapons (although it is widely believed that Israel is also in possession of nuclear arms). South Africa is the only nation to have successfully built a nuclear weapon and, as a result of intense international pressure, has since dismantled its weapons program. It is crucial that the nuclear capable nations (and especially those that maintain an active weapons program) take all necessary pre-cautionary measures to ensure that their own stockpiles are well documented, centralized, and secured. These efforts, however, are far from complete. According to a report released by the International Atomic Energy Administration (IAEA), there were more than 2,100 reports of loss, theft, and illegal acquirement of nuclear materials by the member nations from 1993 to 2011, of which about 400 incidents involved unauthorized possession, movement, or attempts to illegally trade or use nuclear and radioactive materials. Various attacks on nuclear facilities, and high-profile incidents of theft and sale of HEU on black markets have led to increased concerns of a nuclear terrorist plot. Known somewhat infamously as the “Khan” network (named after Pakistani nuclear scientist Abdul Qadeer Khan), the presence of a number of “black markets” have enabled states like Libya, Iraq, Iran, North Korea, and Pakistan to illegally acquire weapons-grade nuclear materials. Additionally, as Ms. Smyser noted, there are significant security concerns regarding the storage of nuclear isotopes at medical laboratories and research facilities, which would be especially vulnerable to attack. With the world’s largest stockpile of nuclear weapons, Russia’s efforts at securing its nuclear facilities are absolutely essential for international security. However, Russia’s stores are spread thinly all across a vast amount of space and are thus difficult to secure and account for effectively. According to the CRS, “reports of Russian nuclear materials for sale on the black market, when combined with evidence of weaknesses in the security system have raised concerns about the possible theft or diversion of nuclear materials from these facilities” although the United States and Russia have cooperated on a number of fronts to reduce the threat of nuclear proliferation and war. This has included, among other initiatives, the conversion of weapons-grade plutonium to non-weapons-grade, sharing early warning data, agreements to transparency, safeguards, and irreversible talks, and economic initiatives for proliferation prevention (IPP) programs. Pakistan’s nuclear stockpile has also been a subject of significant international concern, as the political integrity of the Pakistani state is sometimes threatened by political instability. 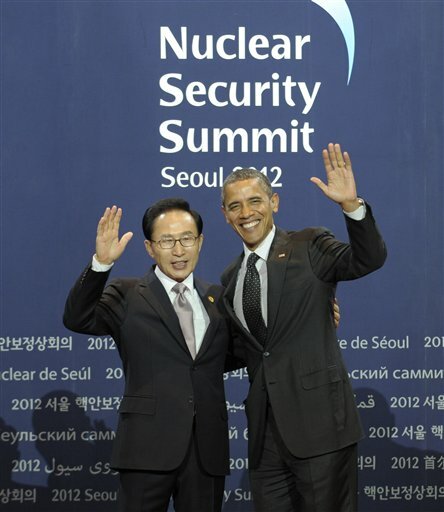 To address some of the significant problems with the current state of international nuclear security, in April of 2010, the United States hosted the 2010 Nuclear Security Summit, wherein leaders and representatives from forty-six governments convened to discuss measures to better safeguard weapons-grade plutonium and uranium and to prevent nuclear terrorism. The results of the summit were largely symbolic, with only a handful of governments committing to new, detailed initiatives to increase domestic nuclear security. However, at the conclusion of the summit, seven countries had agreed to the removal of HEU from their facilities and a number of others committed themselves to begin converting weapons-grade uranium and plutonium to non-weapons-grade. A detailed list of the committments made at the summit (by country) can be accessed here. And again, in March of this year, another Nuclear Security summit was convened in Seoul, South Korea, wherein member nations reported on the statuses of fulfilling their committments and addressing questions regarding the production of nuclear isotopes. Ms. Smyser concluded her discussion with a brief assessment of the current state of affairs in global nuclear security. She remarked that there is significant disagreement among various nations regarind the nature of the nuclear threat. Some nations, like the United States, are deeply worried about the possibility of a nuclear attack, while others are less inclined to give it attention. Additionally, she highlighted the need for more bilateral and multilateral cooperation among participating nations. Non-nuclear powers must also committ to initiatives concerning nuclear security as proliferation networks extend all across the world. And finally, Ms. Smyser emphasized the need to sustain previous committments. If global nuclear security is only as good as its weakest member, then the whole community must actively cooperate with one another to ensure that the nuclear materials of the world are well accounted for and secured.